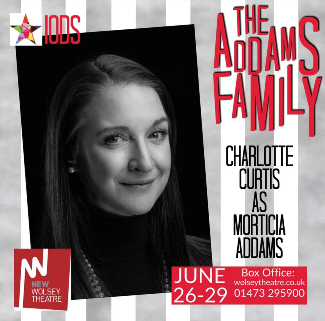 Introducing our Addams Family Cast! Owen joined IODS Theatre Company 5 years ago playing the role of Ali Hakim in ‘Oklahoma’ (Ipswich Regent). Since then Owen has enjoyed being a member of the ensemble in ‘Dirty Rotten Scoundrels’ (New Wolsey), ensemble in ‘Sounds Familiar’ (St Peters by the Waterfront) & ‘Sounds like Christmas’ (St Peters by the Waterfront) where he very much enjoyed being a member of the production team! 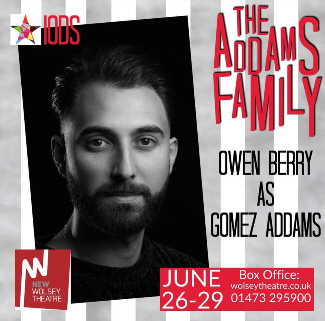 Owen was also very proud to take on his first directing role with ‘My Fair Lady’ which played at the Ipswich Regent last year, but is now thrilled to be back on the stage as Gomez Addams. Charlotte joined IODS in 2014 and has played Mary in Sunset Boulevard, Gertie in Oklahoma!, and Glinda in The Wizard of Oz as well as being featured ensemble in Dirty Rotten Scoundrels (Renee) and My Fair Lady (Maid). With other companies Charlotte has had roles as: Sarah in Guys & Dolls (WWAOS), Helen in The Vortex (Paper Lantern), Anne Boleyn in Wolf Hall (Gallery Players), and Mrs Hurst in Far From The Madding Crowd (Gallery Players). 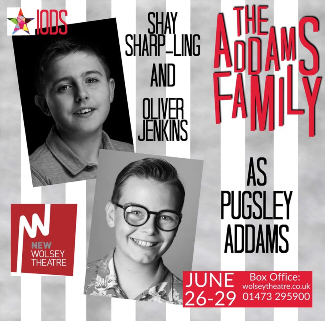 Shay started performing 2 years ago when he joined Pauline Quirke Academy Ipswich. He also has singing lessons with Alex Johnson an Andrew Lloyd Webber Scholar, whilst training at Mountview. Theatre experience: Pauline Quirke Academy productions: The Lazy Ace in Shaftsbury Avenue, London- Ensemble, How the Grinch stole Christmas- Ensemble and Hairspray jr- Ensemble. CBM Theatre Productions: Bugsy Malone- Lt O’Dreary and Ensemble (Felixstowe Spa Pavilion), High School Musical- Mongo and Ensemble (Felixstowe Spa Pavilion) and What’s a Musical? - Billy Elliot (Electricity) and Ensemble. Oliver attends PQA Ipswich, which he goes to every Saturday. He has performed ‪Into The Woods‬, Hairspray, Grinchmas & various other showcase productions with them. He also got to perform in the West End and be part of the choir that sang with G4 on two of their tours last year! He is a member of CBM Theatre & has performed Bugsy Malone & High School Musical at The Spa with them. He also enjoyed being in the Ensemble for The Wizard of Oz with IODS. 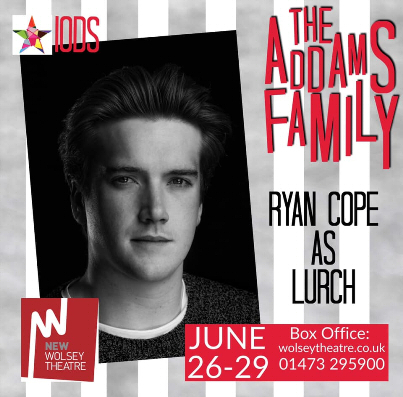 Ryan is thrilled to be playing the role of Lurch, making his theatrical debut with IODS Theatre Company. Ryan appeared in Mad Hatters production of ‘Big Fish’ at the Headgate Theatre in Colchester in March 2019. Previous roles include Darryl in Witches of Eastwick during his second year at college. Being tall already, Ryan will be the perfect stature for the looming figure of Lurch and he can’t wait to get practicing on stilts! 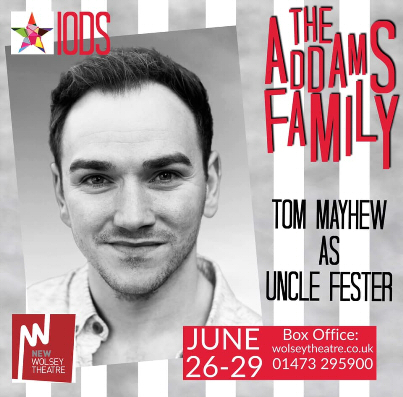 Tom is really looking forward to performing with IODS Theatre Company again for The Addams Family after his appearance as Freddy in My Fair Lady last year. Ensemble work includes Love Story (New Wolsey, Gallery Players), Follies (New Wolsey, Gallery Players), Oh What a Lovely War (Sir John Mills, Gallery Players). Tom has also appeared in pantomimes for The Dennis Lowe Theatre Company at the Spa Pavilion, including the title role of Aladdin and Prince Charming in Cinderella. Hannah grew up watching musical theatre and was finally brave enough to audition for a part in Legally Blonde at Spotlight Productions in Cambridgeshire when she was 17 years old. After thoroughly enjoying the experience of playing a Cheerleader in the production, Hannah auditioned for and secured the part of Sister Mary Roberts in Sister Act in 2018. 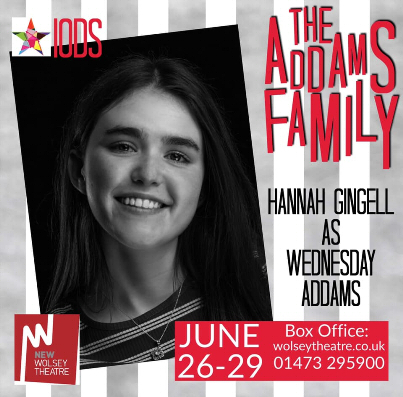 Now 19 and having recently moved to Ipswich, she is extremely excited to be given the challenge of playing the crazily wonderful character of Wednesday. Hannah feels very blessed to have found such a lovely and supportive group of people to work and perform with. Stephen studied Drama at Northgate Sixth Form under the guidance of Gloria Henshall (Ruthies mum). He has gone on to play many different parts since this time - Freddy (My Fair Lady); Joe (Some Like it Hot); King Arthur (Camelot); King of Siam (King and I); Mushnik & Dentist (Little Shop of Horrors); Reecey (Our House); Fagin (Oliver) and has played Dame for the Dennis Lowe Theatre company since 2015. Stephen is thrilled to be playing the part of Mal as he gets to be part of the chaos that is the Addams Family whilst trying to keep a straight face. This is the first time Stephen has performed with IODS and we are thrilled to have him! Steph is no stranger to the local theatre scene and has been treading the boards for many years. Previous roles for IODS include Polly (Crazy For You), Lina Lamont (Singing In The Rain), the title role in Evita, Reno Sweeney (Anything Goes), Aunt Eller (Oklahoma! ), Norma Desmond (Sunset Boulevard, winning NODA’s John White ‘Best Actor in a Musical’ award) and Muriel (Dirty Rotten Scoundrels). 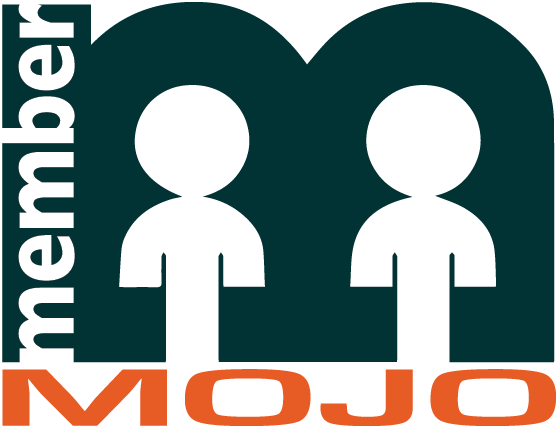 Roles for other companies include Mrs Potts (Beauty and the Beast), the Witch and Jack’s Mother (Into the Woods), Sally (Follies), Mrs Lovett (Sweeney Todd) and Mother Superior (Sister Act). 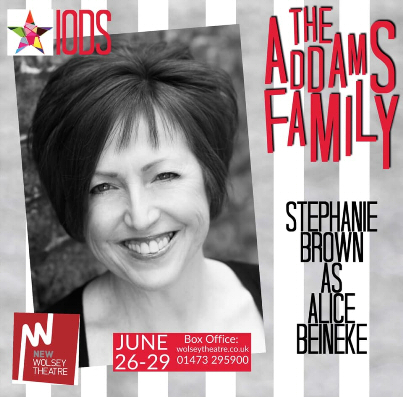 She is very excited to be adding Alice Beineke, the neglected housewife with a burning secret, to her long list of theatre credits and hopes you will come and support this fabulous show. Sam is delighted to have recently been offered a place at the prestigious Arts Ed school of Musical Theatre in London. 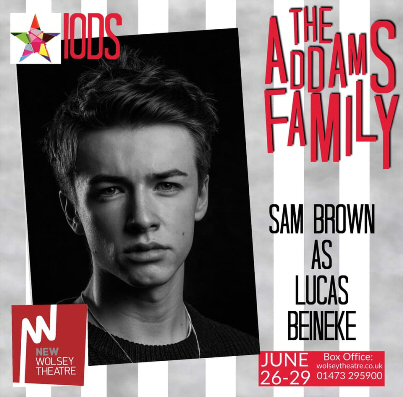 Having previously played Slim in ‘Oklahoma’ and The Scarecrow in ‘The Wizard of Oz’ (both at the Ipswich Regent) Sam is very much looking forward to performing with IODS Theatre Company again. 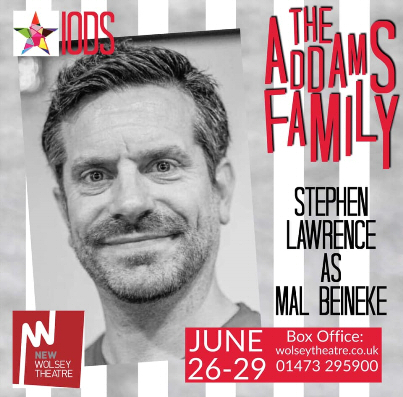 He also feels very lucky to be able to perform at The New Wolsey Theatre for the sixth time in an Open season production.He can’t wait to start rehearsing for this wierd and wonderful show. Marius, ‘Les Misérables’ (The Childrens Theatre Company – The Corn Exchange), Chip Tolentino, ‘Spelling Bee’ (Gallery Players - Sir John Mills Theatre), Rum Tum Tugger, ‘Cats’ (The Childrens Theatre Company – The Apex), Eddie Birdlace, ‘Dogfight’ (Eastern Edge Theatre Company – St Peters Church), Link Larkin, ‘Hairspray’ (The Childrens Theatre Company - The Apex), Joseph, ‘Joseph and his technicolour dreamcoat’ (The Childrens Theatre Company - The Apex) and many others! Angela started dancing at 3 years of age and went on to train and teach all types of dance becoming a Licenciate of the ISTD. She ran her own school in Colchester and also taught classes in the Tendring area alongside being a member of Clacton and Colchester Societies where she played various comedy roles including pantomime Principal Boys, Scarecrow, Ado Annie (Oklahoma) and Gladys (Pajama Game). She has also choreographed shows for Clacton and was Director’s Assistant at Colchester. She joined IODS in 1996 and has great fun juggling her love of theatre plus 4 grandchildren. 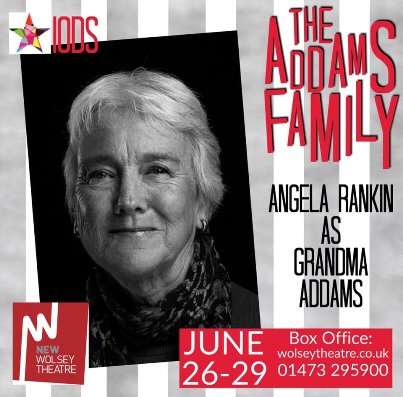 She is very excited to become Grandma again – to the Addams family!